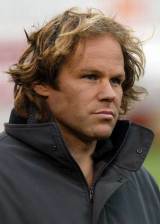 Kronfeld was widely regarded as one of the greatest exponents of back-row play during an international career that spanned 1995-2000 and included two Rugby World Cup tournaments. He began his relationship with Otago as a student where he made an immediate impression that saw him earn selection for National Provincial Championship honours in 1993. Later the same year he was part of the side that recorded a famous victory over the British & Irish Lions. He went on to make his international debut against Canada at Eden Park in 1995 and would feature in the All Blacks side that lost in the Rugby World Cup Final later the same year. Despite that disappointment, the tournament signalled his emergence alongside winger Jonah Lomu and fly-half Andrew Mehrtens as genuine stars of the game. A second Rugby World Cup appearance followed in 1999 and he shared in the agony of another high-profile loss - this time at the hands of France in the semi-finals. He made his final appearance for New Zealand against South Africa in Johannesburg during the 200 Tri-Nations series. A passionate surfer, Kronfeld remained a key figure for Otago and the Highlanders following the start of Super Rugby until he called time on his career in New Zealand in favour of a lucrative move to the northern hemisphere with English side Leicester Tigers. Following his retirement in 2003, he returned to Otago to study physiotherapy and made numerous media appearances including TVNZ series "Dancing with the Stars".